The Europe peat market depicts the presence of a highly consolidated market, says Transparency Market Research on the basis of a recently published report. Such a consolidated nature majorly exists owing to the presence of a handful of companies. Neova Ab, Bord na Mona, Oulun Energia, Klassmann Dielmann, and Vapo Oy, are some of the key players operating in the Europe peat market. These players accounted for almost 80% of the overall revenue generated in the market in 2015. In spite of such a consolidation, many of these companies are moving towards cleaner energy sources. Peat being a low grade coal variety, it is not as efficient as the other types such as anthracite and bituminous. Due to this, a significant drop in the demand for peat is being noted, consequently making players broaden their horizons. Several businesses operating in the Europe peat market are tying up with other organizations to carry out necessary research and development needed to revamp the industry. As per market experts, the Europe peat market had accumulated revenue worth US$2.05 bn in 2016, which is further expected to rise only marginally up to US$2.13 bn by the end of 2024. This sluggish growth is projected to occur at a lowly 0.6% CAGR during the forecast period from 2016 to 2024. In terms of market growth, the demand for peat is foretold to occur at a slow pace during the upcoming years. This is mainly due to an increase in the use of non-conventional energy sources, thanks to rising environmental issues regarding pollution. This sluggish growth is likely to continue in future, which could even go on until all the peat reserves on the planet are depleted. Wood fiber, coir, land fill biomass, and green compost are some of the alternatives being utilized in replacement of peat reserves. However, a marginally good growth by this market is witnessed in the agricultural and horticultural domains. This is mainly due to peat being used extensively in the above-mentioned industries, majorly for providing high quality aeration and moisture to soil. 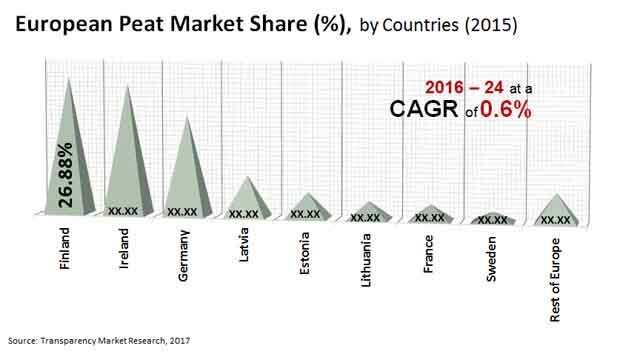 Nevertheless, such applications are not enough to build a miracle growth for the Europe peat market, and its present rate of expansion could just remain the same during the forthcoming years. In terms of restraining factors, several governmental regulations and environmental concerns has remarkably affected the Europe peat market. This trend is anticipated to continue during the forecast period, and is therefore expected to unfavorably affect the market growth. Moreover, the resources are not spread evenly across Europe. Due to specific countries monopolizing on the use and availability of peat, the Europe peat market’s expansion is being hampered notably from a geographical perspective. However, peat is largely used for fueling power plants in several regions, thus contributing towards a marginal growth witnessed by the Europe peat market. Coupled with this, a fairly extensive use of peat in the horticultural and agricultural fields could offset most restraints affecting the market. In terms of market growth, the demand for peat is foretold to occur at a slow pace during the upcoming years. A marginally good growth by this market is witnessed in the agricultural and horticultural domains.